Why should you buy a thesaurus for your child? This is a good question, especially if you’re thinking that your child already has a school dictionary. But dictionaries and thesauruses go together like bacon and eggs, fish and chips, pap and wors, or just about any other classic duo, as seen in our December blog post. So why isn’t it a case of either/ or? How do dictionaries and thesauruses complement each other? A thesaurus gives you a list of words with similar meanings (synonyms) as well as words with the opposite meaning (antonyms), whereas a dictionary usually gives you the definition of a word. So a dictionary tells you what a word means, and a thesaurus helps you find exactly the right word to use in a specific context. Oxford thesauruses also offer thousands of example sentences, which further help you communicate your exact intentions. It is quite apt then that the word ‘thesaurus’ literally means ‘treasure’, as it offers you a treasure trove of words to choose from, to enhance your language usage and enrich your expression. A thesaurus also helps you to avoid repetition and grow your vocabulary. Surely there are some parents and teachers out there who are pretty tired of the monosyllabic retorts being grunted at them: fine, good, yes. Wouldn’t it be rather pleasing to hear that your child had a marvellous day, that they think your ideas are splendid, or that spending time working on a group activity was peachy? Ideally, every classroom and every home should have a thesaurus. 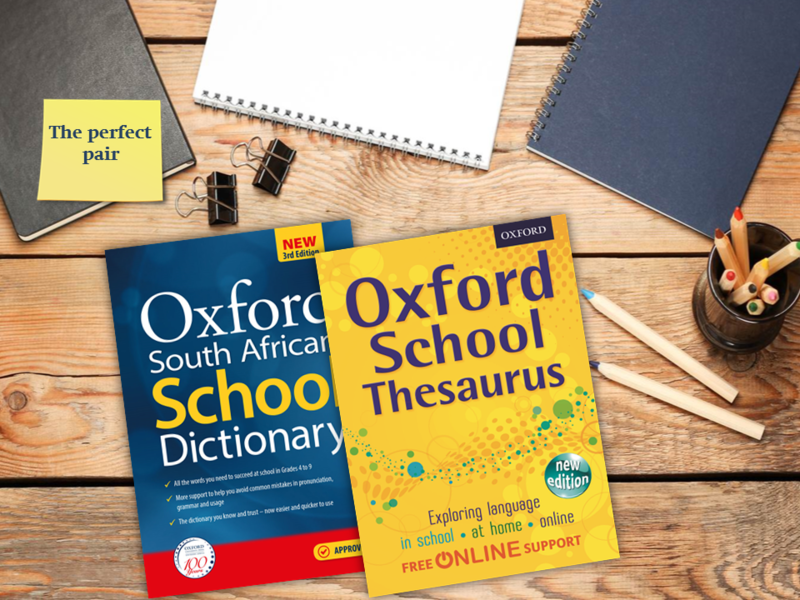 Not only are these the ideal locations to support learners with homework and language-related tasks, but a thesaurus is also a very handy tool to help people of all ages win at word games and puzzles.